Image courtesy of Emily Chapman. Licensed under CC BY 2.0. Despite Atlanta being a physically very large city (as evidenced by the recent, massive Snowpocalypse 2: Electric Bugaloo leaving folks with hour-plus commutes stranded on the highways), I spend my time in a small areas of town. I live and work in Midtown. I volunteer and drink cheap beer in Little Five Points. I went to school, grew up in, and now drink fancy beer in Decatur. The Westside, Mechanicsville, the Highlands–all within five miles of me–see me very rarely. I head outside the Perimeter maybe twice a year. As a result, it was only through a friend’s invitation that I wound up out in Chamblee‘s Chinatown for this weekend’s Lunar New Year festival. It was completely delightful. First off, there was food everywhere. The festival mostly took place in the Chinese Cultural Center‘s main event space, and the entire long back wall was packed with folks selling cheap, delicious Chinese food (and slightly more expensive, though still cheap, food for those who wanted luxuries like signs in English). For once in my life I had cash on hand, and snagged rice noodles, sesame balls full of red bean paste, a spring roll, bubble tea, and six pancakes full of custard. It was enough food for two meals and the whole shebang was $13.50. Plus: red bean paste for days. 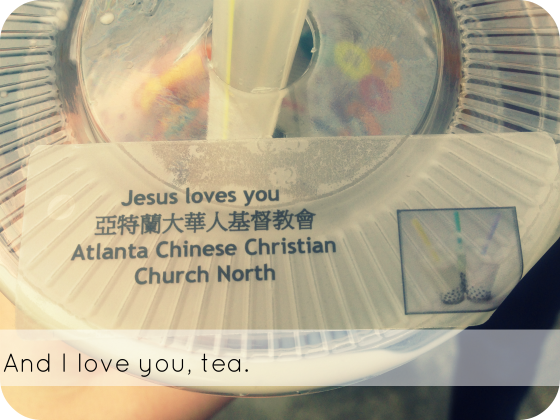 The bubble tea, pictured above, was purchased off a youth group member. The church, in a savvy move, had fitted out some remarkably non-sullen teens with cigarette-girl holders for bubble tea and set them lose to sell drinks to young folks while very gently evangelizing via cups. The kids, who seemed to be somewhere around 14, were super-cute, earnest things. They were approximately 8,000 times less sullen than I was at any point between the ages of 12 and 17, which was impressive. In front of the food, there was a stage where an impressive roster of performers cycled through during the day. We saw a Chinese yo-yo performance with schoolkids ranging from 8 (adorable) to 17 (legitimately impressive–I fully see that kid being college roommates with a David Bowie in Labyrinth contact juggler, teaming up and being rad). A line dance class of elderly Chinese women performed the choreography to “Gangham Style,” with one woman–probably in her 60s, decked out in a blue sequin leotard and a bright green tutu–leading the way. A man dedicatedly sang Chinese pop hits which I had, of course, never heard in my life. It was great. Despite the fact that walking around Chamblee in cheap shoes has made it so that my feet still hurt (seriously, I am old enough now that my feet hurt all the time, ugh), I’m glad I went. It was a nice reminder that Atlanta has all kinds of things happening, all the time. Plus: red bean paste!